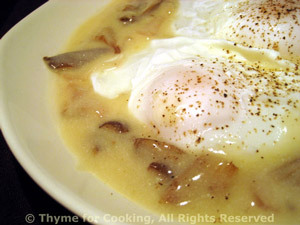 Poached Eggs in White Wine Mushroom Sauce, Thyme for Cooking first course. Poached eggs with red wine is a traditional dish of Burgundy. This is a variation using white wine and mushrooms. Use 1 or 2 eggs per person. Clean, trim and thickly slice mushrooms. Heat oil in a nonstick skillet, add mushrooms and sauté until well browned. Put white wine into a small saucepan and bring to a boil. Boil over medium-high heat, uncovered, for 5 minutes. Wine will reduce slightly. Dissolve cornstarch in water and add to wine, stirring until thick and clear. Remove from heat, stir in yogurt, mushrooms, cover and keep warm. Fill a medium skillet with water. The water should be at least 1 1/2 inches deep. Remove eggs with a slotted spoon, drain and put into a soup plate or flattish bowl. Spoon sauce around the eggs and serve, salt & pepper on the side.